Unique design – for excellent water flow! With the spoon and the water-level mark, you add just the right amount of salt and water – for a pleasant experience, every time! Ideal at home and when travelling. With NoseBuddy, nose cleansing soon becomes as easy and natural a part of daily hygiene as brushing your teeth. A quality product created from more than 40 years of experience teaching nose cleansing. Designed and produced in Sweden by the non–profit organisation Scandinavian Yoga and Meditation School. Yogi’s NoseBuddy is made of PP plastic and the spoon of PS plastic, both approved for medical use and recyclable as hard plastic. CE–marked as a medical–technical product. “NoseBuddy,” is a registered trademark/trademarks in the EU, US, and/or other countries and belong to the Scandinavian Yoga and Meditation School. Yogi’s Nosebuddy can be bought from our webshop, or any of our international resellers. 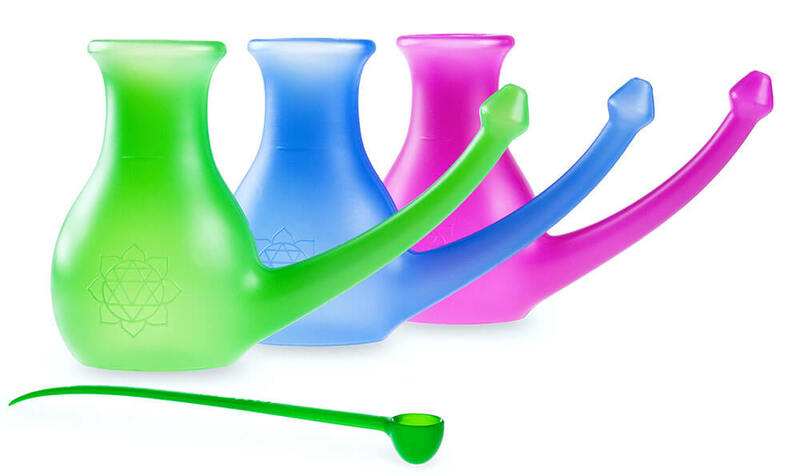 Neti – a refreshing yoga practice! Traditionally recommended for the relief and prevention of nasal congestion, the common cold, sinusitis, hay fever and other allergies – and for increased mental clarity.